The Marware C.E.O. Premiere and SportGrip are two completely different types of cases, but when put together they offer great protection. The C.E.O. Premiere is a folio style case while the SportGrip is a thin and well-designed silicon sleeve type accessory. Pictured above is the case and it is made out of premium genuine-leather and is a great offering for anyone who enjoys the versatility of having a folio iPhone case. You slide your phone into the pouch compartment and then pull the leather top over which sticks via velcro. The velcro is made from a special material so it won’t rip and it’s also sewed into the case so it won’t come apart like some other products. The case is very-well stitched and this creates a very durable and long lasting design. The speaker, microphone, headset jack, and sleep/wake/power buttons are all accessible from the top or bottom of the case. The dock connector and volume keys are not accessible and this seems obvious as there are straps to prevent the case from falling out. The case’s design prevents dents and nicks as there is room between all sides of the phone and the tip of the case. The sides of the case are open for access to the aforementioned buttons but there are straps to prevent the iPhone 4 from falling. The bottom of the case has a small opening where the micro-sim slot is, but the hole is not large enough for the phone to fall through. I’ve personally ran while using this case clipped to my shorts and I had absolutely no issues. There was not even a sense of the iPhone 4 falling out of the case. The clip is well built and clips to your clothes in a way that it won’t fall off. We highly recommend the Marware C.E.O Premiere as it is one of the best designed and protective folio-cases on the market currently. It comes in either black or brown, both with a white stripe, and they are both very stylish The case has a suggested retail price of $34.99 and you find one here. The Marware SportGrip for iPhone 4 is a good silicon sleeve that offers decent protection. The back is a fairly thin silicon layer while the sides are made out of thick silicon. There are holes for the camera, LED flash, speaker, dock connection port, both microphones, and the headset jack. When the case is out by itself without a phone in place don’t be fooled by it’s weak appearance. When you place the iPhone 4 in the SportGrip you immediately get the well-protected feeling. The case will prevent scuffs, and light to fairly medium dents on the sides. The case is taller than the top of the screen which helps to prevent screen shatters. This goes for the front and the back. The back’s thin silicon layer will prevent scratches more than damage but that is where the thick sides come into play. This case is not perfect on its own but it’s a fantastic compliment to the C.E.O. Premiere Folio cases. 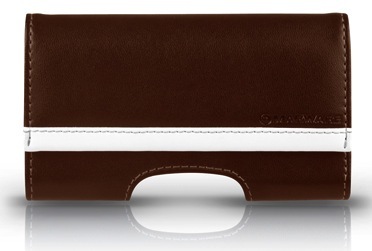 It’s the perfect case to put your iPhone 4 in then put in the folio. It fits perfectly and is easy enough to take in and out with no worries. The SportGrip ships in six colors: black, blue, white, pink, red, and frosted. You can get one here for a suggested retail price of $19.99.